Can My CV Expose Me to Identity Theft? 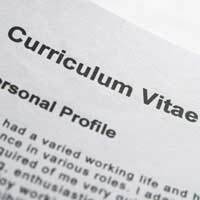 Home > Ask Our Experts > Can My CV Expose Me to Identity Theft? I would like to ask you what are the dangers, in a case of possible identity theft, when the scammers have my CV containing: my name, surname, date of birth, address, univeristy I'm studying.What are the next steps to take in order to prevent any identity theft consequences. A CV contains so much personal information about us that it’s quite startling to see how many people adopt a very casual attitude towards it in terms of who you decide to share that information with. Firstly, you should always be very aware of posting it up onto a forum where anybody can view it. In doing so, just remember that if you allow open access to it, it can then be viewed by anybody around the world and that includes potential fraudsters. When e-mailing a CV in response to a job advertisement, if there is a company e-mail address to send it to, check out the company first before sending it so that you can be sure they’re legitimate. However, if you’re uploading your CV without knowing the destination it’s going to, try to find out a phone number of the company and ask them for information about the company that way so you can check them out. For example, a non-specific e-mail address such as a Yahoo or Hotmail one tells you nothing about the company. Therefore, it begs the question – who are they? Remember, with details such as your name, address, date of birth (if you’ve included it but not necessary to include on a CV), phone number and e-mail address, that’s a lot of information that could potentially be used by scammers who are looking to profit from identity theft. If you feel you may have unknowingly become a victim, then the next thing you should is to start becoming extremely vigilant. Keep an eye on things like bank and credit card statements and look out for any items on your statements that you haven’t bought. It’s also a good idea to request a copy of your credit file to check for any suspicious applications for loans, HP agreements or credit applications that may have been made in your name. If something like this has occurred, notify the police immediately. Another good idea is to contact CIFAS and apply for protective registration. By registering you’ll have been asked to supply a password and this means that if anyone (including yourself) applies for any kind of credit or financial service in your name in the future, then it will require a password to proceed which will stop any fraudulent applications being made in your name. Finally, learn to treat your CV with the same care as you would with things such as bank cards and PIN numbers. Make absolutely certain that you know where your CV is going before you hit the send button. By hitting send indiscriminately, you may have just transmitted many of your personal details to a completely unidentifiable stranger in an unknown country. Good information - I'm soon to teach at a CV workshop and I think the way that CV's include so much personal information is now out of date. My students say they are happy to give a mobile number or email contact online - but will need to check out any callers before revealing their home address/phone details. I think they are right.